Would you like to help families in Puerto Rico and Mexico who lost everything from Hurricanes and Earthquakes? You will have the opportunity TODAY so don’t miss it! You can enjoy delicious food during lunch and contribute to the cause. MYA and MYD will sell flautas (fried tacos) for $1.50, horchata for $1, corn in a cup for $1 and fruit for $1. GHS is hosting the Elkhart County College Fair on Tuesday, October 3rd from 6:30-8:00 p.m. in Whiteman gym. 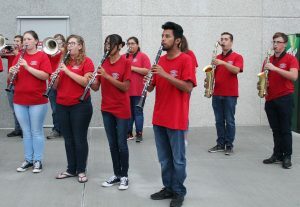 Students and parents from area schools are welcome to attend and should enter the school through Door M. The Armed Services and over 65 post-secondary schools will be represented. There will be two financial aid meetings offered at 7:00 p.m. – one in the auditorium in English and one in the cafeteria in Spanish. These information sessions are an opportunity for students and parents to learn about the college financial aid process. This event is a great opportunity for students to talk with college representatives to learn more about their school and gather information on what different schools have to offer. A wide range of post-secondary schools will be represented with 2-year, 4-year, technical, public and private schools all planning to attend. In honor of the Day of German Unity on October 3rd, next week will be German Club spirit week! Show your spirit for the German culture and language by participating in the spirit days, and win prizes at lunch! The Northridge Student Publications and Student Council will be selling Nelson’s chicken and pit-tatoes at the game TONIGHT. Chicken will be available for sale from 4:30-8:00 p.m. or until sold out. IHSAA Student-Athlete Tip of the Week: How do you respond as an athlete when things aren’t going well for you? How do you act when you are demoted or you aren’t playing as much as you wish? Are you still happy to be a part of the team, or do you put yourself first and continue to think that you deserve more than your coach is giving you? Do you quit or stick it out? While I know that it is very difficult to practice hard and give it your all, you can still be important to your team in a supporting role. In life, you will be challenged with these same decisions when things aren’t going well. Will you quit, or will you stick it out? Those who stay involved for the long haul won’t win every battle, but having the right attitude and never quit persona will serve you much better than quitting! The Ultimate Frisbee Club is hosting a Culver’s Give Back night on Monday, October 2nd from 5:00-8:00 p.m. Come eat a delicious meal and show your support! Drive thru orders also count. Mrs. Gomez Wengerd will be taking students on a college visit on October 27th to Goshen College! This is a first come, first serve opportunity with priority given to upperclassmen. See Mrs. Gomez Wengerd in guidance for a permission slip! They are due by October 13th. Women’s Empowerment Club will have a call-out meeting on Thursday, October 5th during the 2nd session of SRT in room 3130. ALL are welcome. Come and check it out! Contact (sponsor) Ms. Lisa Caskey (lmcaskey@goshenschools.org) or Stephanie Covarrubias Palomino (President, covars@students.goshenschools.org) for more information if you can’t make it to the call out meeting. The girls varsity soccer team finished their regular season last night with a 1-1 tie at West Noble. Jocelyn Valderrama scored for the RedHawks. The girls finished the year 10-3-3 and now begin preparation to host Sectionals next week. Goshen will play next Thursday at 7:30 p.m. against the winner of the first round match-up between Concord and Northridge. The Goshen JV team finished their regular season losing to Lakeland Christian’s varsity 4-1. Maddie Swallow scored Goshen’s only goal. Jasmine Hernandez had ten keeper saves. The JV girls finished with a 9-3-1 record. The girls finish out their season this Saturday at the JV Warsaw Tournament. Goshen plays Concord in the first round at 9:00 a.m. The girls JV and varsity volleyball teams lost to Plymouth. The boys varsity tennis team will host the sectional championship at 4:30 p.m. The winner of M2 will play the winner of M3. The boys varsity football team will travel to Northridge at 7:00 p.m. Girls volleyball will compete in the Dunes Tournament. JV plays at 8:30 a.m., followed by varsity at 9:00 a.m. Girls JV soccer will play in the Warsaw Invitational at 9:00 a.m. The boys/girls JV and varsity cross country teams will run in the NLC championship at Ox Bow starting at 9:00 a.m. The boys JV football team will host Northridge at 10:00 a.m.
Congratulations to GHS Art teacher and independent artist Tom Zuber, upon being recognized for two 2017 American Art Awards! Mr. Zuber took 1st place in Abstract Expressionism and tied for 6th place in Cubism. This year the American Art Awards (www.AmericanArtAwards.com), juried by the 25 Best Galleries & Museums In America, had online art images in 50 CATEGORIES submitted from artists in 56 COUNTRIES: Albania, Argentina, Australia, Belarus, Brazil, Canada, China, Denmark, Egypt, England, Finland, France, Georgia, Germany, Greece, Hong Kong, India, Ireland, Israel, Italy, Japan, Kazakhstan, Latvia, Lithuania, Luxembourg, Macedonia, Malaysia, Mexico, Myanmar, Netherlands, New Zealand, Nigeria, Norway, Pakistan, Papua New Guinea, Pakistan, Philippines, Poland, Romania, Russia, Serbia, South Africa, South Korea, Sri Lanka, Spain, Sweden, Switzerland, Taiwan, Thailand, Turkey, UK, Ukraine, USA, Uzbekistan, Vietnam and Wales. A self-described creative, Thomas Zuber has been driven to ‘make stuff’ from an early age. From winning an American Bicentennial locker-art competition in the first grade to showcasing his latest feature-length film in local theaters, to exhibiting his paintings in museums, Zuber has indeed been creatively industrious. After studying under painter Harold Zisla and sculptor Harold “Tuck” Langland, Zuber received his BA in Fine Arts, with a concentration in sculpture, from Indiana University, in 1991. In 1995, he was offered a teaching position in Bloomington, MN. There, Zuber learned the art of teaching as he instructed students in Studio Art and Art History. In 2002, he returned to the South Bend, IN area and continued to teach. During this period he resumed painting, and slowly began exhibiting and selling semi-abstract watercolor and acrylic paintings to private collectors. After completing his M.A. in Art Education through Boston University, Zuber returned to painting in earnest, working in Abstract Expressionist and Cubist styles. He currently exhibits in group shows, and has become a frequent award-winning artist through the Midwest Museum of American Art. As opportunities continue to grow, Zuber is becoming an emerging artist that will make his collection one to be envied. GCS offers congratulations to Tom, and appreciation to all of the working/teaching artists who share their gifts with GHS students every day! Would you like to help families in Puerto Rico and Mexico who lost everything from Hurricanes and Earthquakes? TOMORROW you will have the opportunity so don’t miss it! You can enjoy delicious food during lunch and contribute to the cause. MYA and MYD will sell flautas (fried tacos) for $1.50, horchata for $1, corn in a cup for $1 and fruit for $1. The Northridge Student Publications and Student Council will be selling Nelson’s chicken and pit-tatoes at the game on Friday. Chicken will be available for sale from 4:30-8:00 p.m. or until sold out. Mrs. Gomez Wengerd will be taking students on a college visit on October 27th (permission slips are due 10/13) to Goshen College! This is a first come, first serve opportunity with priority given to upperclassmen. See Mrs. Gomez Wengerd in guidance for permission slips! Swimmers and Divers from the 2016-17 Team: There will be a very brief meeting TODAY at the beginning of the 1st session of SRT in the main gym. Please do not report to your SRT. Come straight to the main gym. The meeting will be less than ten minutes long to update you on some very important news regarding the upcoming season. Stay In Bounds Ambassadors will meet TODAY during the 2nd session of SRT in the main gym to separate into groups, finalize tee shirt plans, turn in green sheets and field trip sheets, and to start planning your first lesson. It is important that all attend. If you are also a member of Student Council, you are expected to attend the SC meeting first and Mrs. Pierce will release you to the Ambassador meeting after roughly 15 minutes. Art Club will have their first meeting TODAY during the 2nd session of SRT. All creative students needing a place to connect should come to the meeting. We will be electing officers and deciding what things to do during the year. For any girls interested in being a manager for the Girls Basketball Program – Please come to room 8030 TODAY during the 2nd session of SRT for a short informational meeting with Coach Hill. If you have other commitments, please come see Coach Hill TOMORROW morning at 8:00 a.m. in the weight room. The boys varsity tennis team will host sectionals semifinals at 4:30 p.m. where Goshen will play the winner of match 1. The girls freshman volleyball team will host Plymouth and Angola at 5:00 p.m. The boys freshman football team will host Warsaw at 5:30 p.m. Girls varsity soccer will travel to West Noble at 5:30 p.m. The girls JV volleyball team will play at Plymouth at 5:30 p.m. Varsity will play at 7:00 p.m. The boys soccer C team will host Penn at 6:00 p.m. Girls JV soccer will host Lakeland at 7:30 p.m.
MYA members are concerned about families in Mexico  and Puerto Rico  that have been devastated with the recent Earthquakes and Hurricanes. We want to help. This Friday, September, 29th we are having a fundraiser at GHS during all of the lunch periods. You can send donations if you are unable to come and enjoy our delicious food. All profits will be sent to both countries in distress. Thank you MYA, for helping to raise funds for others in need! 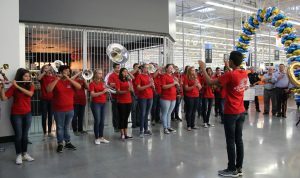 Members of the Goshen High School band played the national anthem as part of the Grand Opening celebration for Walmart #1566. Because of rain, the ceremony was moved inside, so the drum line did not play. However, according to the public and officials in attendance, the band still sounded great, even without the drums. And a surprise! 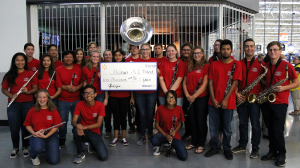 Walmart donated $1,000 to the Goshen High School band. 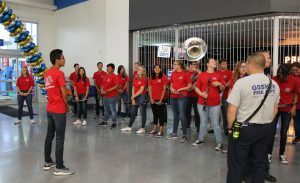 After the ceremony, the kids put away their instruments and ate Grand Opening cupcakes. A huge thank you to the students and directors for representing Goshen High School so well. 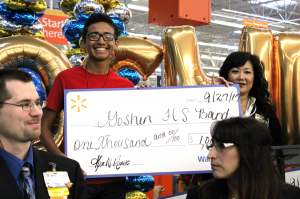 And, a special thank you to Walmart for supporting GHS students; GCS appreciates your generosity! Attention Students: Herff Jones will be here TOMORROW at 7:45 a.m. outside the main office to take class ring orders for any grade, and for senior orders for caps and gowns, graduation announcements and other senior items. Extra packets are available in the main office. The German Club has new officers! 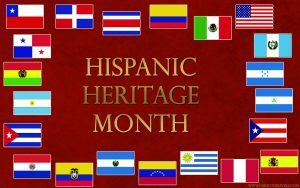 Congratulations to Rafael Ramirez, Holly Klemm, America Contreras and Tammy Medina! Mrs. Gomez Wengerd will be taking students on two college visits – on October 10th to Bethel College (permission slips were due 9/26) and October 27th (permission slips due 10/13) to Goshen College! This is a first come, first serve opportunity with priority given to upperclassmen. See Mrs. Gomez Wengerd in guidance for permission slips! Stay In Bounds Ambassadors will meet TOMORROW during the 2nd session of SRT in the main gym to separate into groups, finalize tee shirt plans, turn in green sheets and field trip sheets, and to start planning your first lesson. It is important that all attend. If you are also a member of Student Council, you are expected to attend the SC meeting first and Mrs. Pierce will release you to the Ambassador meeting after roughly 15 minutes. Art Club will have their first meeting TOMORROW during the 2nd session of SRT. All creative students needing a place to connect should come to the meeting. We will be electing officers and deciding what things to do during the year. Those student-athletes who attended the first Ambassadors meeting or have seen Mr. Kissinger about participating MUST attend a meeting TOMORROW during SRT during the 2nd session of SRT in the main gym. This meeting will be for planning of groups, schools, t-shirt design and starting on your lesson plans for your first visits in October, which will be the week after fall break. See you there! The girls varsity soccer team finished up their NLC schedule by winning a close battle with Concord last night 2-1. Jill Kissinger and Aniya Hartzler each scored a goal to lead the offense. Madi Rittenhouse had seven saves in goal for the RedHawks. The girls are now 10-3-2 on the season and finished the season as one of the top three teams in the NLC conference. The JV team won an NLC championship by defeating Concord 2-0. Maddie Swallow scored both goals to lead the offense. Priscilla Ramirez assisted on one of the goals. Keeper Jasmine Hernandez had three saves in goal for the RedHawks. The girls finished undefeated in the conference and are now 9-2-1 on the season. The boys varsity tennis team will host the 1st round of sectionals at 4:30 p.m. Match 1 will be Jimtown vs. Northwood and Match 2 will be Fairfield vs. Bethany Christian. Good luck! 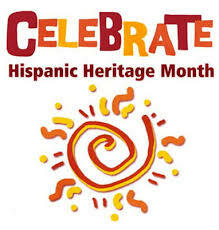 For resources to learn more about Hispanic Heritage Month, check out your school library or the Goshen Public Library. 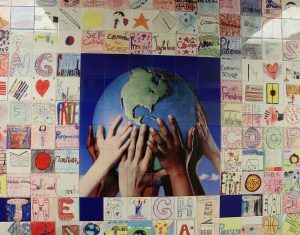 At Goshen Community Schools, we celebrate our culturally rich educational environment, which inspires everyone to learn and grow. 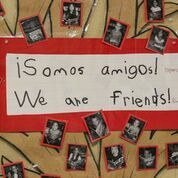 A bulletin board display from one of the elementary schools. 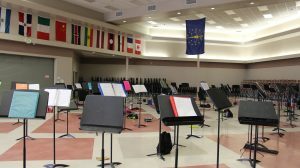 The GHS cafeteria (pictured here during band camp), has flags around the perimeter that represent the countries of origin of GHS students. If a student enrolls from a country that is not yet represented with a flag, the principal orders a new one to represent the student’s country of origin. If you go into the cafeteria, you will see that the flags go almost all the way around the room. 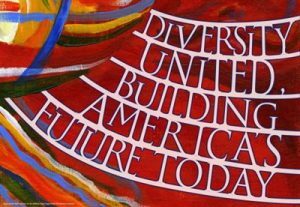 It is a very visible reminder of the rich diversity present in GHS students and in our schools. 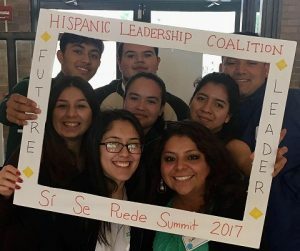 Carson Adkins, Ramona Aguilar, Angel Baiza, Brian Beas, Javier Castillo, Yenifer Escobedo, Arturo Escobedo-Hernandez, Ainsley Friesen, Alex Garcia, Bryan Garcia, Cruz Garcia, Julia Giddens, Sarah Gregory, Dan Guipe, Andria Hershberger Catron, Logan Hochstetler, Preston Hubbard, Sam Linares, Oscar Lopez, Tara Martin, Maddy Martinez, Eve Miller, Gage Miller, Ariel Nissley, Carolina Olivo, Noe Palacios, Pablo Palacios, Jaime Parga, Hope Peeler, Fabian Perez, Melissa Quiroz, Jianni Reina, Phares Roll, Yaira Roman, Dylan Steury, Ben Taubert, Jimmy Torres, Katie Weadick, Catelin Weaver, Evan Yoder, Ben Yonts, and Jason Zuniga. Watch for more information on the students’ performance tomorrow! Goshen High School is hosting the Elkhart County College Fair on Tuesday, October 3rd from 6:30-8:00 p.m. in the Whiteman gym. 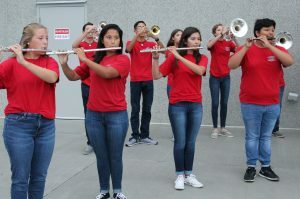 Students and parents from area schools are welcome to attend and should enter the school through Door M.
The Armed Services and over 65 post-secondary schools will be represented. There will be two financial aid meetings offered at 7:00 p.m. – one in the auditorium in English and one in the cafeteria in Spanish. These information sessions are an opportunity for students and parents to learn about the college financial aid process. This event is a great opportunity for students to talk with college representatives to learn more about their school and gather information on what different schools have to offer. A wide range of post-secondary schools will be represented with 2-year, 4-year, technical, public and private schools all planning to attend. If you have questions, you may call the GHS Guidance Office at 574-533-8651, ext. 2403. Attention Students: Herff Jones will be here on Thursday at 7:45 a.m. outside the main office to take class ring orders for any grade, and for senior orders for caps and gowns, graduation announcements and other senior items. Extra packets are available in the main office. Drama Club will host their first meeting TODAY in the Auditorium at 3:45 p.m. Drama Club is open to anyone interested in knowing more about theatre productions and involvement. Mrs. Gomez Wengerd will be taking students on two college visits – on October 10th to Bethel College and October 27th to Goshen College! This is a first come, first serve opportunity with priority given to upperclassmen. See Mrs. Gomez Wengerd in guidance for permission slips! Bethel College permission slips are due TODAY and Goshen College permission slips are due October 13th. The next German Club meeting will be TODAY during the 2nd session of SRT in the main gym balcony. See you there! French Club will hold the first meeting of the year TODAY during the 2nd session of SRT in room 2430. The club is still looking for a freshman representative, junior representative and a secretary. If you are interested in any of those positions please contact Miss Mack before Friday, September 8th. Art Club will have their first meeting on Thursday during the 2nd session of SRT. All creative students needing a place to connect should come to the meeting. We will be electing officers and deciding what things to do during the year. Those student-athletes who attended the first Ambassadors meeting or have seen Mr. Kissinger about participating MUST attend a meeting during SRT on Thursday during the 2nd session of SRT in the main gym. This meeting will be for planning of groups, schools, t-shirt design and starting on your lesson plans for your first visits in October, which will be the week after fall break. See you there! Drama Club will host their first meeting TOMORROW in the Auditorium at 3:45 p.m. Drama Club is open to anyone interested in knowing more about theatre productions and involvement. Mrs. Gomez Wengerd will be taking students on two college visits – on October 10th to Bethel College and October 27th to Goshen College! This is a first come, first serve opportunity with priority given to upperclassmen. See Mrs. Gomez Wengerd in guidance for permission slips! Bethel College permission slips are due TOMORROW and Goshen College permission slips are due October 13th. The next German Club meeting will be TOMORROW during the 2nd session of SRT in the main gym balcony. See you there! French Club will hold the first meeting of the year TOMORROW during the 2nd session of SRT in room 2430. The club is still looking for a freshman representative, junior representative and a secretary. If you are interested in any of those positions please contact Miss Mack before Friday, September 8th. The boys varsity football team lost to Warsaw 21-0. The boys JV soccer team tied with Ft. Wayne Carroll 0-0. The varsity team won 2-1. The boys JV soccer team defeated Homestead 2-1. The varsity team lost 3-2. The girls varsity soccer team played two games in Fort Wayne on Saturday. In the first game, Goshen lost a close battle with Ft. Wayne Carroll 1-0. Keeper Madi Rittenhouse had ten saves to keep the game close. The JV team lost to Carroll 6-0. In the second game, Goshen tied Homestead 2-2. After going down by two goals, Aniya Hartzler led the comeback with two spectacular goals. Madi Rittenhouse also had seven crucial saves to keep the game tied. After Saturday’s games the girls are now 9-3-2. The JV team lost to Homestead 7-0. They are now 8-2-1 on the season. The girls JV volleyball team defeated Elkhart Christian Academy. The varsity team lost to ECA. The boys soccer C team will play at Warsaw at 5:30 p.m. The Northridge Student Publications and Student Council will be selling Nelson’s chicken and pit-tatoes at the game next week. Chicken will be available for sale from 4:30-8:00 p.m. or until sold out. Drama Club will host their first meeting on Tuesday, September 26th in the Auditorium at 3:45 p.m. Drama Club is open to anyone interested in knowing more about theatre productions and involvement. Merit on the Move started this week! See your counselor to sign up. Spots are limited! Mrs. Gomez Wengerd will be taking students on two college visits – on October 10th to Bethel College and October 27th to Goshen College! This is a first come, first serve opportunity with priority given to upperclassmen. See Mrs. Gomez Wengerd in guidance for permission slips! Bethel College permission slips are due September 26th and Goshen College permission slips are due October 13th. Pay to see your favorite teacher get a pie in the face! Put money in the vase with your teacher’s face on it at the homecoming table during lunch. IHSAA Student-Athlete Tip of the Week: Today, more than ever, it’s so important for the student-athlete to understand what is expected of them, both in the classroom and field of play, and want to accomplish those expectations. There are so many outside influences by personal trainers, tutors and parents. How well do you analyze your teachers and coaches? Do you know their expectations? Are you flexible and try to fit in, or are you defiant and want to do things your way? The student-athlete who truly understands what is expected of them has the greatest chance of achievement. Instead of worrying about what’s best for you, think in a different way. Think about what you must do in order to impress your teachers and coaches, thus giving you a greater opportunity for success! This week is Homecoming and below is a list of Spirit Week themes. Please participate by dressing according to the theme. There will be a pep rally during school TODAY full of fun activities, games and new cheers. Please come ready to show your school spirit! The Homecoming Court will be presented during half-time of the football game TONIGHT. Thank you to all who voted! Our Homecoming dance will be TONIGHT after the football game. It will start at 9:30 p.m. and go until 11:30 p.m. The theme is Super-Hero and is casual. The tickets will be sold at lunch for $5 and will be $6 at the door. Art Club will have their first meeting on Thursday, September 28th during the 2nd session of SRT. All creative students needing a place to connect should come to the meeting. We will be electing officers and deciding what things to do during the year. Those student-athletes who attended the first Ambassadors meeting or have seen Mr. Kissinger about participating MUST attend a meeting during SRT on Thursday, September 28th during the 2nd session of SRT in the main gym. This meeting will be for planning of groups, schools, t-shirt design and starting on your lesson plans for your first visits in October, which will be the week after fall break. See you there! The girls JV volleyball team defeated Concord. The varsity team lost to Concord. On senior night the Goshen girls soccer team earned their 7th consecutive win with a 3-0 victory over East Noble. Sophomore Hailey Mast led the offense with two goals. Hannah Kurtz also scored for the RedHawks. Jill Kissinger and Noelia Calderon assisted on the goals. The Goshen girls record now stands at 9-2-1 on the season. The girls play again this Saturday when they travel to Fort Wayne for two games. Thanks to everyone who came out and helped honor seniors Jill Kissinger, Hannah Kurtz, Jhoana Gomez, Noelia Calderon, Jasmine Hernandez, Daphne May, Karla Walton and Maggie Vargas. It was a great night of celebration! The boys varsity soccer team defeated Warsaw 2-1. The JV team defeated Warsaw 3-0. The boys freshman football team lost to Concord 68-0. Boys varsity football will host Warsaw at 7:00 p.m. The boys varsity tennis team will compete in NLC finals in Plymouth at 9:00 a.m. The boys and girls JV and varsity cross country teams will run in the New Haven Classic at IPFW at 9:00 a.m. The boys JV and varsity soccer teams will host Ft. Wayne Carroll at 10:00 a.m. and Homestead at 2:30 p.m. Girls JV and varsity soccer will play at Ft. Wayne Carroll at 10:00 a.m. and at Homestead at 2:30 p.m. The girls JV and varsity volleyball teams will play at Elkhart Christian Academy. JV plays at 9:00 a.m., followed by varsity at 10:30 a.m. The boys JV football team will travel to Warsaw at 10:00 a.m. Attention Students: Herff Jones will be here Thursday, September 28th at 7:45 a.m. outside the main office to take Class Rings orders for any grade, and for senior orders for caps and gowns, graduation announcements, and other senior items. Extra packets are available in the main office. There will be a pep rally during school TOMORROW full of fun activities, games and new cheers. Please come ready to show your school spirit! The Homecoming Court will be presented during half-time of the football game TOMORROW. Thank you to all who voted! Our Homecoming dance will be TOMORROW after the football game. It will start at 9:30 p.m. and go until 11:30 p.m. The theme is Super-Hero and is casual. The tickets will be sold at lunch next week for $5 and will be $6 at the door the night of the dance. The Teen Health Club meeting is TODAY in The Guidance Office conference room during the 2nd session of SRT. If you are interested in a health career or healthy life choices, please plan to attend and invite others to join us. The boys varsity tennis team will compete in NLC 2nd round at Concord at 4:30 p.m. The boys JV and varsity soccer teams will play at Warsaw. JV starts at 5:30 p.m., followed by varsity at 7:15 p.m. Boys freshman football will host Concord at 5:30 p.m. The girls JV and varsity volleyball teams will host Concord. JV plays at 5:30 p.m., followed by varsity at 7:00 p.m. The freshman team will host Central Noble and Concord at 5:30 p.m. The girls varsity soccer team will host East Noble at 6:00 p.m. Merit on the Move starts TODAY. See your counselor to sign up. Spots are limited! There will be a pep rally during school on Friday full of fun activities, games and new cheers. Please come ready to show your school spirit! The Homecoming Court will be presented during half-time of the football game on Friday. To vote for the court, check your e-mail and fill out the form. Voting will be closed TODAY and you can only vote once. Our Homecoming dance will be on Friday after the football game. It will start at 9:30 p.m. and go until 11:30 p.m. The theme is Super-Hero and is casual. The tickets will be sold at lunch next week for $5 and will be $6 at the door the night of the dance. If you are bringing a guest from another school, you need to see Mrs. Wolfe in the main office to get the outside guest form. This needs to be turned in by TODAY. Homework help is available every Thursday in the media center from 3:45-5:00 p.m. A bus will be available around 5:10 p.m. (5:20 p.m. on Tuesdays) if you need a ride home. It will pick you up at the south end of circle drive by the flag pole. This is a great opportunity if you just need a little extra time or even just a quiet place to do your homework at the end of the day. Next week we will start offering this on Tuesdays as well. The Teen Health Club meeting TOMORROW in The Guidance Office conference room during the 2nd session of SRT. If you are interested in a health career or healthy life choices, please plan to attend and invite others to join us. The boys varsity soccer team defeated Wawasee 10-2. The girls JV and varsity volleyball teams both lost to Northwood. The boys cross country team beat Northwood 20-41 and lost to Elkhart Memorial 27-30. Felix Perez Diener was the individual winner followed by Jason Barahona 2nd, Jonathon Snyder 7th, Bryan Olvera 12th, Sam Miller 13th, Griffin Hetler 15th and Shawn Gulec 18th. The girls cross country team lost to Northwood 42-19 and lost to Elkhart Memorial 34-23. Yadira Sanchez placed 4th followed by Paola Rangel 10th, Sophia Koshmider 13th, Kayleigh McKee 17th, Julie Walton Clark 24th, Yessinia Castillo 25th and Elena Meyer-Reimer 27th. Both teams will compete at the New Haven invite on Saturday. The boys varsity tennis team will compete in the NLC Tourney at Concord at 4:30 p.m. Good luck gentlemen! Merit on the Move starts TOMORROW. See your counselor to sign up. Spots are limited! Mrs. Gomez Wengerd will be taking students on two college visits – on October 11th to Bethel College and October 27th to Goshen College! This is a first come, first serve opportunity with priority given to upperclassmen. See Mrs. Gomez Wengerd in guidance for permission slips! The Homecoming Court will be presented during half-time of the football game on Friday. To vote for the court, check your e-mail and fill out the form. Voting will be closed TOMORROW and you can only vote once. Our Homecoming dance will be on Friday after the football game. It will start at 9:30 p.m. and go until 11:30 p.m. The theme is Super-Hero and is casual. The tickets will be sold at lunch next week for $5 and will be $6 at the door the night of the dance. If you are bringing a guest from another school, you need to see Mrs. Wolfe in the main office to get the outside guest form. This needs to be turned in by TOMORROW. The Teen Health Club meeting is Thursday in The Guidance Office conference room during the 2nd session of SRT. If you are interested in a health career or healthy life choices, please plan to attend and invite others to join us. The boys varsity tennis team defeated Elkhart Memorial 5-0. The boys JV football team lost to Concord 40-7. The girls freshman volleyball team will host Culver Academy and Northwood at 5:00 p.m. Boys soccer will travel to Wawasee. The C team plays at 5:00 p.m., followed by varsity at 6:45 p.m. Girls volleyball will host Northwood. JV plays at 5:30 p.m., followed by varsity at 7:00 p.m. The boys and girls JV and varsity cross country teams will host Memorial and Northwood at 5:30 p.m.
Goshen High School will host an information session with the National Immigrant Justice Center on Wednesday, September 20th at 6:30 p.m. The event will be held in the GHS auditorium and is open to the public. Join Goshen Community Schools and immigration attorneys for information regarding legal options for DACA recipients. 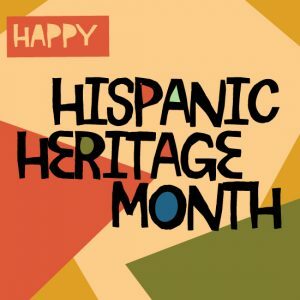 Miércoles, 20 de septiembre, 6:30 p.m.
Las escuelas de la comunidad de Goshen junto con abogados de inmigración acerca de las opciones legales para los beneficiarios del programa DACA. Congratulations to members of the Crimson Marching Band for placing 1st in class A and winning the best music, best effect and best visual captions at the Concord Invitational! 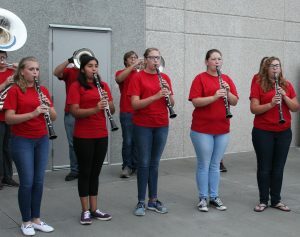 The group was also the highest scoring band of any group participating. Merit on the Move starts Wednesday. See your counselor to sign up. Spots are limited! The Homecoming Court will be presented during half-time of the football game on Friday. To vote for the court, check your e-mail and fill out the form. Voting will be closed on Wednesday and you can only vote once. Our Homecoming dance will be on Friday after the football game. It will start at 9:30 p.m. and go until 11:30 p.m. The theme is Super-Hero and is casual. The tickets will be sold at lunch next week for $5 and will be $6 at the door the night of the dance. If you are bringing a guest from another school, you need to see Mrs. Wolfe in the main office to get the outside guest form. This needs to be turned in by Wednesday, September 20th. Homework help is available every Thursday in the media center from 3:45-5:00 p.m. A bus will be available around 5:10 p.m. if you need a ride home. It will pick you up at the south end of circle drive by the flag pole. This is a great opportunity if you just need a little extra time or even just a quiet place to do your homework at the end of the day. The boys freshman football team lost to Northwood 36-0. The boys varsity football team lost to Concord 49-14. In a close battle on Saturday the Goshen girls soccer team defeated Fort Wayne Concordia 3-2. Jill Kissinger led the Goshen offense with two goals. Hannah Kurtz also scored for the RedHawks. Alexa Medina assisted on two of the goals. Madi Rittenhouse had eleven saves in goal. The girls won their 6th consecutive game and are now 8-2-1 for the season. Goshen will host East Noble for senior night this coming Thursday. The JV game starts at 5:00 p.m. followed by the varsity at 6:45 p.m. Goshen will be honoring eight seniors: Hannah Kurtz, Jill Kissinger, Noelia Calderon, Jhoana Gomez, Daphne May, Jasmine Hernandez, Maggie Vargas and Karla Walton. Come out and help honor this great group of seniors! The boys JV football teams will play at Concord at 6:00 p.m.
Next week is Homecoming and below is a list of Spirit Week themes. Please participate by dressing according to the theme. There will be a pep rally during school on Friday, September 22nd full of fun activities, games and new cheers. Please come ready to show your school spirit! The Homecoming Court will be presented during half-time of the football game on Friday, September 22nd. To vote for the court, check your e-mail and fill out the form. Voting will be closed on 9/20 and you can only vote once. Our Homecoming dance will be on Friday, September 22nd after the football game. It will start at 9:30 p.m. and go until 11:30 p.m. The theme is Super-Hero and is casual. The tickets will be sold at lunch next week for $5 and will be $6 at the door the night of the dance. If you are bringing a guest from another school, you need to see Mrs. Wolfe in the main office to get the outside guest form. This needs to be turned in by Wednesday, September 20th. IHSAA Student-Athlete Tip of the Week: A wise coach once said that it’s just as tough to handle success as it is to handle failure. One current star, professional golfer Jordan Spieth, seems to understand the importance of humility in the midst of his success. When asked about the importance of humility in a recent Golf Digest article, Spieth replied by saying, “My speaking about humility is very difficult, because that wouldn’t be humility.” A student-athlete who understands this lets other people do the talking about who’s good and who’s not. Tooting your own horn can cause a problem bigger than a major traffic jam! Are you looking for an awesome and positive work opportunity? Goshen Culver’s is now hiring! 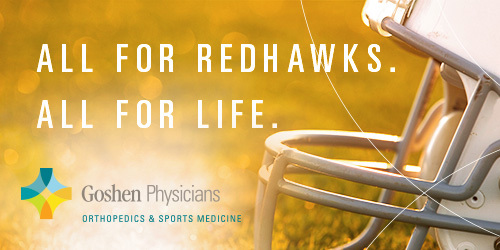 They offer flexible scheduling, competitive pay, opportunities for advancement and countless other benefits. If you are interested, then please inquire at culvers.com, or contact Maxim Potashov at TRGoshen@bleedblue.net. The Crimson Marching Band will compete tomorrow at the Concord Invitational at 9:25 p.m. If you would like tickets to the event you may purchase them in the band office. The cost is $7.00 per ticket. If any student has not received their 2017 yearbook please stop by room 1400 to pick it up. If you wish to purchase one, you may do that in 1400 as well. 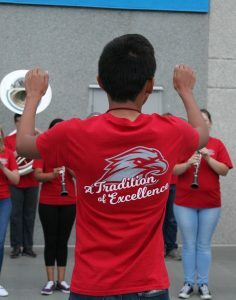 The September issue of The Talon is out NOW! Articles range from the Cross Country’s season starting to opinion pieces on the school dress code, and all are focused on GHS and YOU. Soar into the know at talon.goshenschools.org! Greencroft is looking for a dining attendant. You would be responsible for the sanitary and safe handling of food and equipment and keeping the area clean. Requirements are that you feel comfortable working around the elderly and that you have a pleasant attitude. This is a part-time position working about 12-15 hours per week with hours from 4-7:30 p.m. You would be required to work every other weekend and holiday. Pay starts at $9.18/hour. 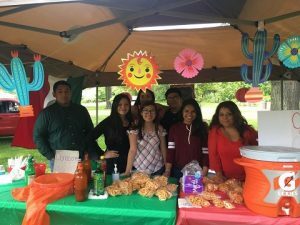 Please apply in person at 1225 Greencroft Dr.
HELP WANTED – Universal Tamal is currently looking to hire a waitress/waiter. You must be 17 years old, speak both English and Spanish and be able to work a maximum of 20 hours per week. For more information please call 534-3736 or stop by in person at 225 S. Main St. in Goshen. The boys varsity soccer team defeated Northwood 6-0. The boys varsity tennis team defeated Plymouth 3-2. The boys JV soccer team defeated Northwood 6-1. In a battle between some of the top girls soccer teams in the NLC last night, Goshen came away with a 2-0 victory over Northwood. Goshen took an early lead on a breakaway goal by Jill Kissinger. In the second half Alexa Medina sealed the win scoring on a cross from Aniya Hartzler. Madi Rittenhouse had seven saves to help the defense secure their 5th shutout of the year. The Goshen girls are now 7-2-1. The undefeated JV team had another strong night beating Northwood 6-1. Priscilla Ramirez, Joana Regalado, Joselyn Guevara, Paulina Ortiz and Yadira Castillo all scored goals for the RedHawks. Joya Drenth assisted on two of the goals. The JV girls are now 8-0-1 on the season. The girls varsity volleyball team lost to Northridge. The girls JV volleyball team defeated Northridge. The boys varsity football team is hosting Concord at 7:00 p.m. The girls varsity golf team will compete in Sectionals at Cobblestone at 9:30 a.m. The boys JV tennis team will host the Wawasee Invite at GMS at 9:00 a.m. The boys and girls JV and varsity cross country teams will compete in the West Noble Invitational at 9:30 a.m. The boys varsity tennis team will compete in LaPorte at the Reed Invitational at 10:00 a.m. Girls varsity soccer will travel to play against Ft. Wayne Concordia Lutheran at 6:45 p.m.
Click on the link below to read a review of the 2017 trip to Stratford, Ontario, Canada. This trip, which is led by English department staff, is an annual event and anyone is welcome! As noted in the Talon article, students do receive an English credit for taking the course and going on the trip. REMINDER: Parent/teacher conferences will be held TODAY from 4-8:00 p.m. at GHS. Enter through the main entrance. You do not need an appointment. This Saturday, the Crimson Marching Band will compete at the Concord Invitational at 9:25 p.m. If you would like tickets to the event you may purchase them in the band office. The cost is $7.00 per ticket. THIS WEEK – NOTE THE CHANGE DUE TO PARENT/TEACHER CONFERENCES: Homework help will NOT be available today due to p/t conferences. It was offered Tuesday of this week. Next week we will resume the normal schedule. Stay in Bounds Ambassadors will have their first meeting of the school year TODAY during the 2nd session of SRT in the main gym. This will be an introductory meeting for interest in the Ambassador program. Returning seniors and interested junior student-athletes are invited. The girls freshman volleyball team will play at Northridge vs. Northridge and Penn at 5:00 p.m. The boys JV and varsity soccer teams will play at Northwood. JV starts at 5:00 p.m., followed by varsity at 6:45 p.m. Girls soccer will host Northwood. JV plays at 5:30 p.m., followed by varsity at 7:15 p.m. Girls volleyball will host Northridge. JV plays at 5:30 p.m., followed by varsity at 7:00 p.m. Boys freshman football will compete at Northwood at 5:30 p.m.